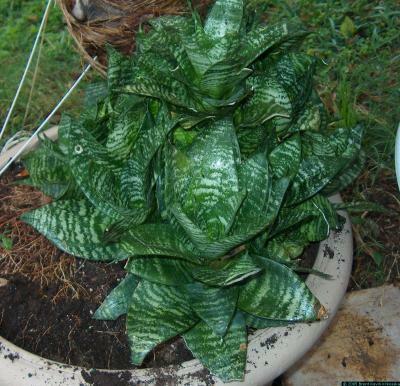 This is another one of the snake plant varieties. It is low growing and clumps. Cuttings can be taken from single leaves. It does fine in full shade or on a kitchen table, and can also live in full sun. It adapts well to a wide range of water and soil conditions. These are all descended from one I got from my mother in the mid 1980's. She had it for about as long as I can remember.